Many beginner runners do a 5K as their first road race and get nervous as they prepare for it. To calm your fears and help you have a successful race, here are some 5K racing mistakes to avoid. Before a race, you don't want to stuff yourself, but you also don't want to have a totally empty stomach. It's not a good idea to eat immediately before running because it may lead to cramping or side stitches. Not eating anything may cause you to run out of energy. Your best bet is to eat a snack or light meal about 1 1/2 to 2 hours before the race starts. You should eat something that's high in carbohydrates and lower in fat, fibre, and protein. Some examples of good pre-5K fuel include: a bagel with peanut butter; turkey and cheese on whole wheat bread; a banana and an energy bar; or a bowl of cold cereal with a cup of milk. Stay away from rich, very fatty, or high-fibre foods, as they may lead to gastrointestinal distress. Even if it's chilly at the 5K start, you're going to warm up a lot, so don't bundle up. If you're warm and comfortable when you first start, you're going to start sweating very early in your run. I've seen lots of 5K racers who end up trying their long-sleeve shirt around their waist because they got too hot. A good rule of thumb: Dress as if it's 20 degrees warmer outside than it really is. Unless you plan on running your 5K in under 20 minutes, you shouldn't be lining up right at the front of the race. It's not fair to the faster runners if they have to weave around slower runners or walkers. Some races have corrals based on estimated pace or post pace signs. If you don't see any signs, ask runners nearby their anticipated pace, and if it's faster than yours, move further back. Most races use timing chips or tags, so the time it takes you to reach the starting line won't count in your final net time. 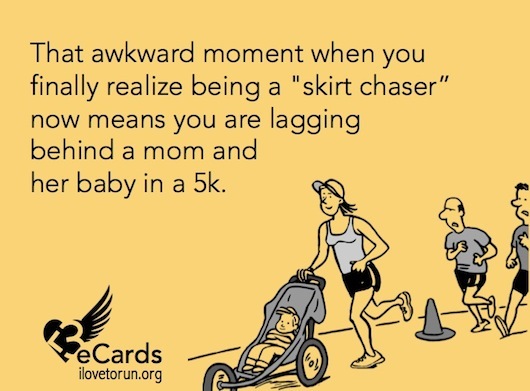 Many 5K runners make the mistake of starting out the race too fast. They feel great during the first mile, but they gradually start running out of steam as they get closer to the finish. Most 5K races have at least one water stop, where volunteers hand out cups of water to race participants. Drinking some water during the race will help you prevent becoming dehydrated, which will improve your performance. Don't assume that drinking water while running gives you a cramp; it’s not true. Even if it's not really warm, you should try to take at least a few sips of water. If it's hot and you're sweating, try to drink the whole cup.